King bed and double futon on each level. Maximum occupancy: 2 adults, 1 child per level. Max. for both levels is 4 adults, 2 children. 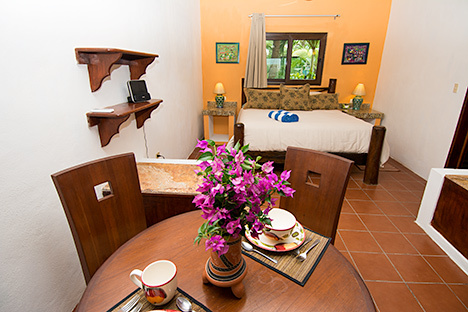 *Price is for single or double occupancy. Add $40/day, $280/wk. per child. Max. each level: 2 adults, 1 child. 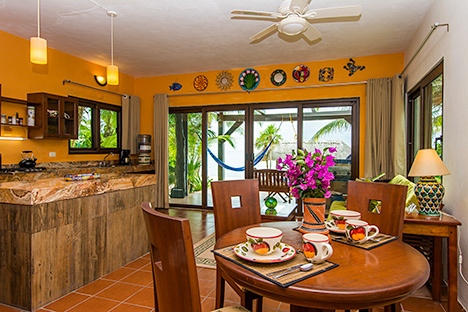 Casa de Canciones (formerly Casa Seahawk) is a delightful double decker vacation rental villa on an incredible stretch of beach on Soliman Bay. The dazzling blue water and powdery white sand make this an ideal little spot in paradise. 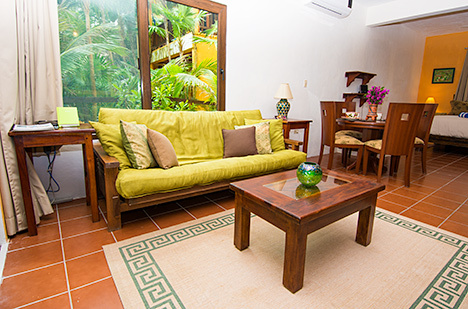 This charming vacation beach bungalow has a 1 BR unit on the first level and another on the second. 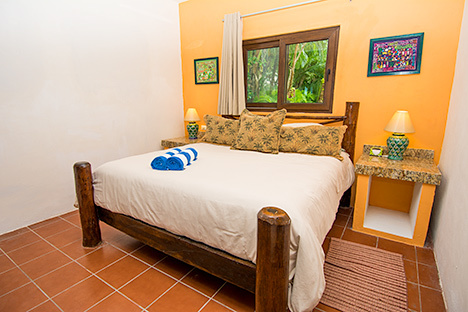 Both have king bed, private bath, living room, dining room and kitchen. Kitchen is complete with microwave, refrigerator and stove. A futon on each level can accommodate one child. 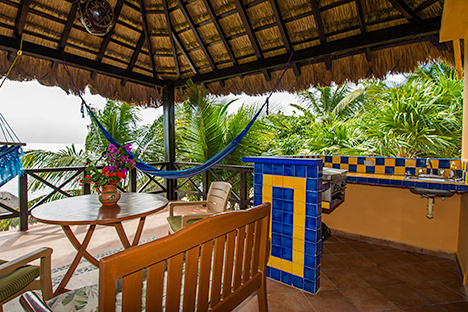 Second level has palapa covered oceanfront patio area with table, chairs and oh-so-comfy hammock chair. 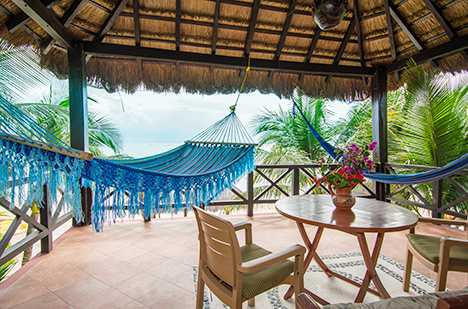 First level has two hammock chairs on the patio facing the ocean. 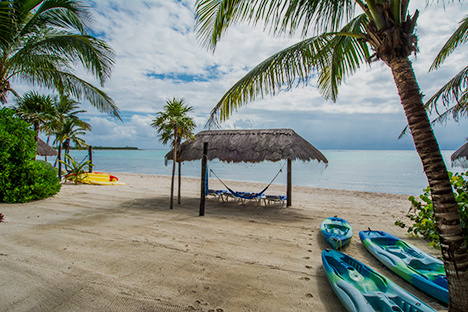 Sea kayaks and snorkel equipment are provided for guest use. 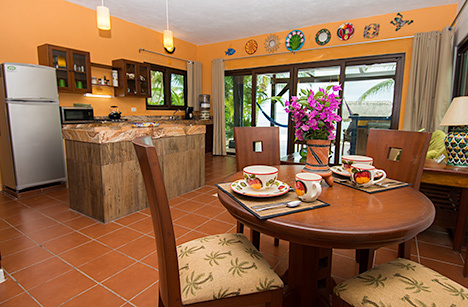 Casa de Canciones vacation rental villa is ideal for a couple or small group seeking the peace and quiet of an out-of-the-way destination. Enjoy your days on the peaceful bay or explore the coast with exursions to jungle cenotes where you can swim in crystal clear, cool waters. 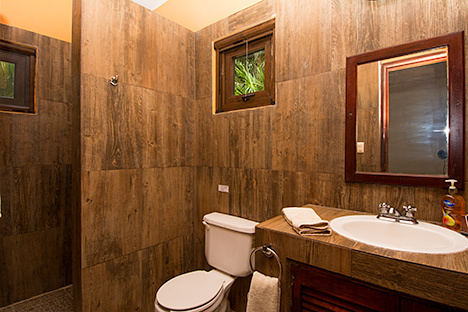 Travel to the Mayan ruins in nearby Tulum. 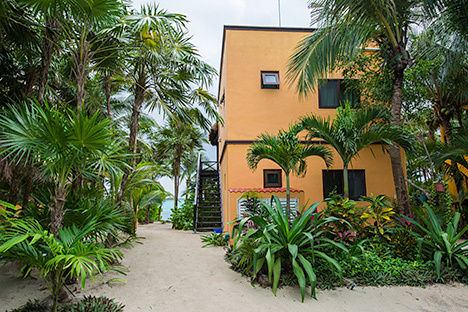 Poke around other beaches, take a day trip to the island of Cozumel. 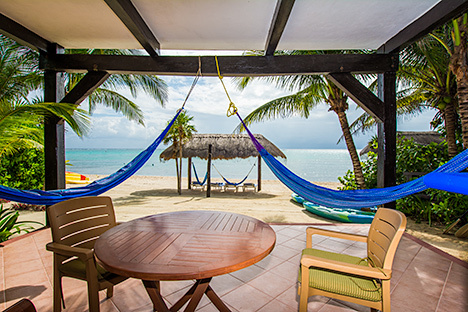 Or just sit on the beach sipping an icy cold beer or frosty margarita. Maximum Occupancy: Max. 2 adults, 1 child each level; max. 4 adults, 2 children if renting both units. 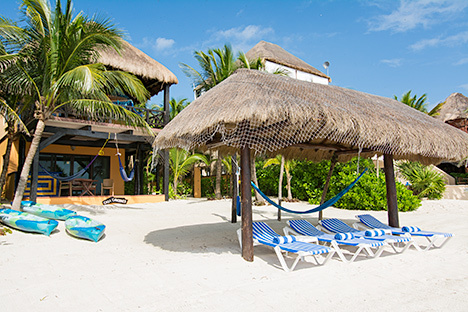 Canciones is a very comfortable and stylish beachfront hideaway! 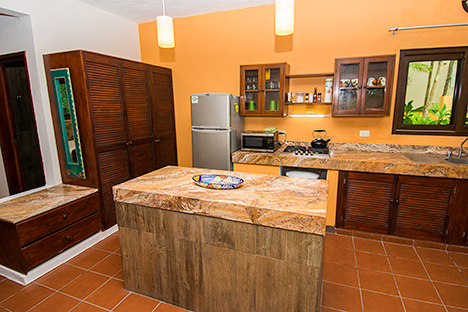 Each level has a full kitchen with refrigerator, 4-burner stove with oven, microwave, dishes, pots and pans, coffeemaker, blender, etc. Bedroom in teh background; the bathroom is on the right. Exterior of Casa de Canciones. You can see stairs on the left that go to the second level unit.